I love joking that I’d make the awesomest grandmother ever. Not mother. Just skip to the part when I can sit around retired and crafting for my progeny. 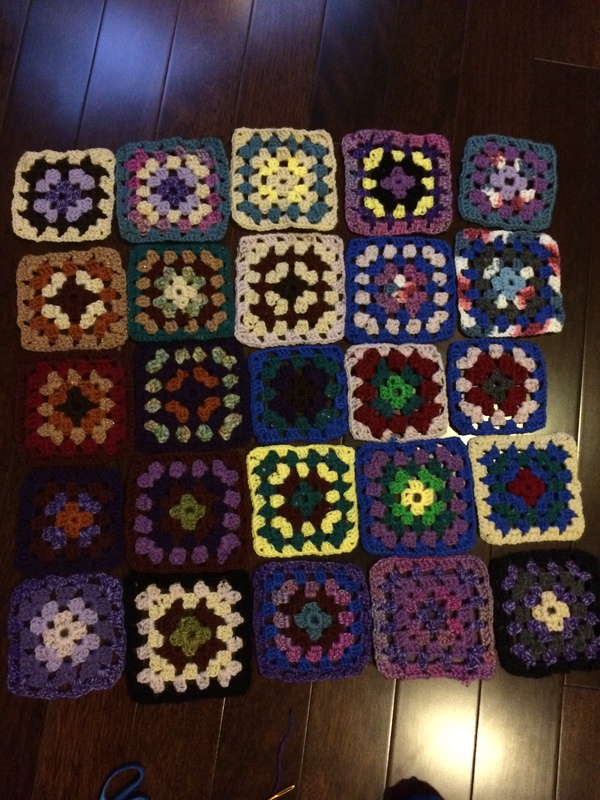 I finished using a majority of my scrap yarn making granny squares. It took me over a year to make 25 squares. There is actually a methodical rule to how I laid these out to optimize the blanket’s visual cohesiveness. 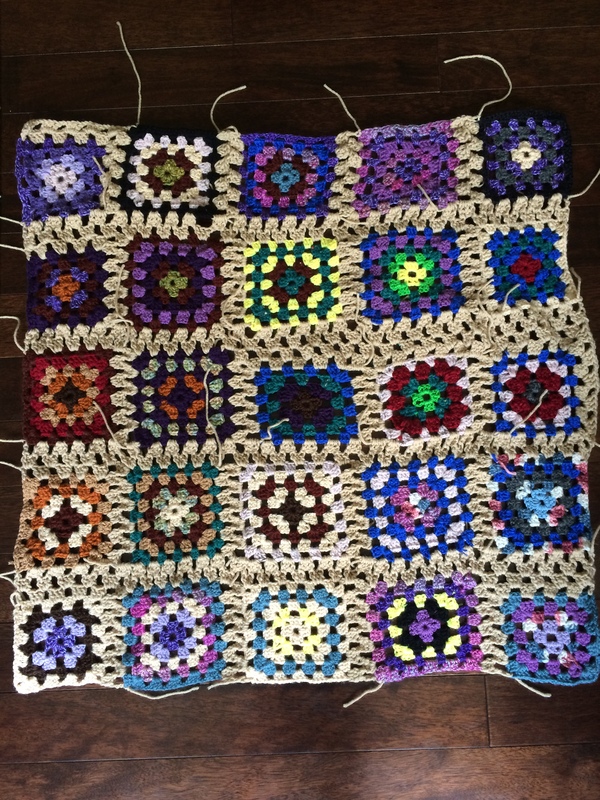 Each granny square is bordered by others that share at least one common color. Laying these out was quite a challenge, but I somehow was able to make it happen. This is my personal Facebook cover photo :D Maybe I should make it my blog banner too? After I joined 5 squares into a row, I joined the 5 rows together. Weaving in the ends is going to be a pain. 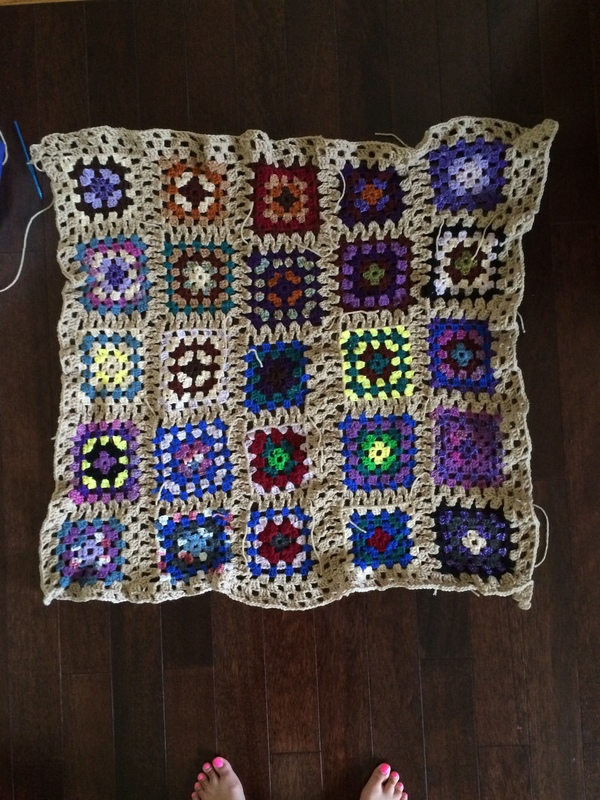 I’m currently working on crocheting a border to frame the colorful center. I’m also using a larger hook to do the joining because I thought it would make a larger blanket, which it does, but also causes curling. 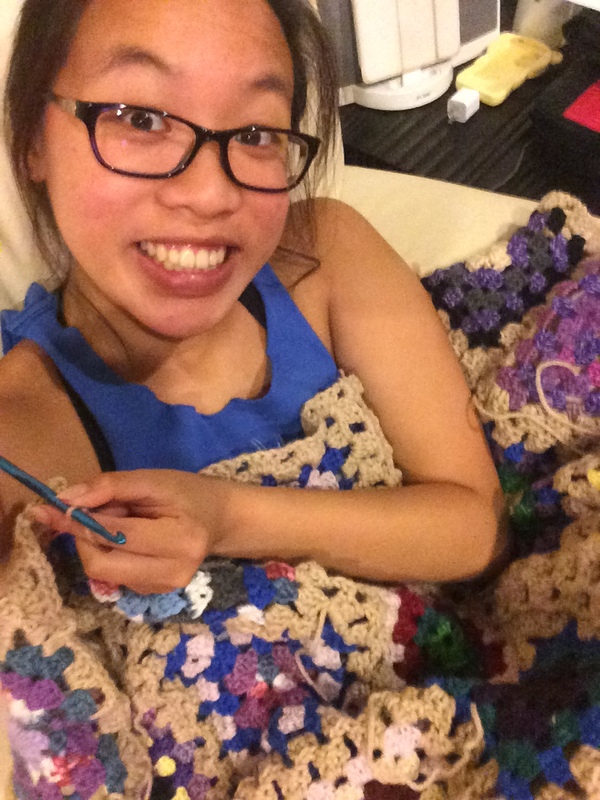 Yeah, newb crocheter status. Hopefully I can block that curling out, which will also be a challenge because the majority of this blanket is acrylic. I’m just going to keep going around the border until I run out of this one pound skein I bought to bring this scrap project together. It may look like I have an actual plan to this project but I honestly just started making granny squares and then from there just took it one spontaneous step at a time. We’ll see where this project takes me. 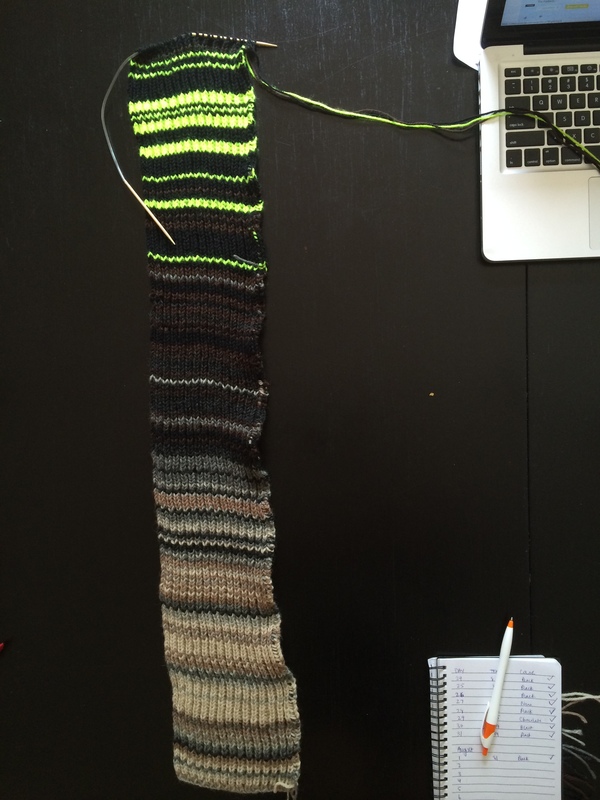 I haven’t done a Sky Scarf Saturday update since June (eep!) and it’s August now. The summer has flown by so quickly. The seasons are really showing in my scarf and I love the neon pops. It’s currently around 33 inches and it’s half done. I’m not sure if only making it for 2014 will be long enough for my liking. 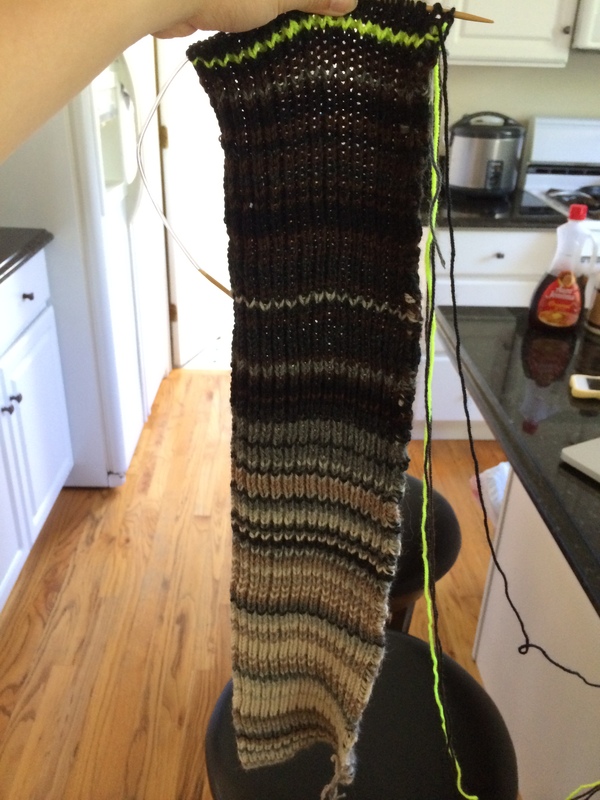 It might take longer to make, which is depressing because I really, really want to wear it ASAP. Patience, grasshopper. It’s been a while since my last Sky Scarf Saturday. I had to catch up on a couple weeks worth of knitting this morning due to the busyness of finishing up school, moving out, and starting my new job. But I’ve got exciting news for you: It reached a high temperature of above 86 degrees this past week, which meant I got to unravel my skein of neon yarn this morning. Although it is a bit of annoyance to add back colors I haven’t used in a while, I love the randomness of how singular stripes look against a mostly dark or light background. 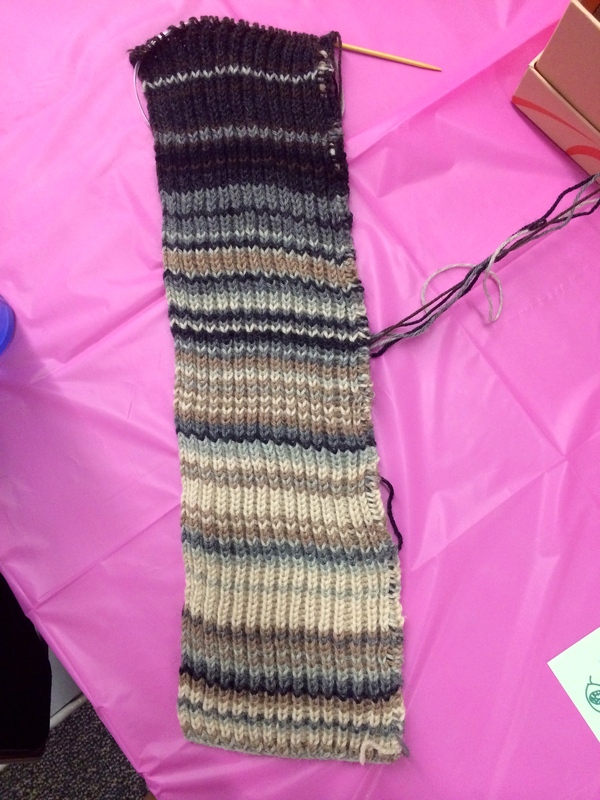 I’m totally geeking out over the nerdiness of this scarf.